I love reading Folding Trees because there are some marvelous images and neat projects there. I saw a post on shadow decorations and really wanted to try it out, but we didn't decorate much for Halloween. I put out a cute little pumpkin from Apple Hill, but otherwise I've been focused on school. I signed up to decorate a car for Trunk or Treat at church, so that I'd get to at least give candy to cute little kids (since we don't get trick-or-treaters). After some pondering and plotting, I finally decided that I would see if I could still fit into my wedding dress. I did fit, so I decided to dress up as a Snow Queen (a good one, not the one from Narnia) and use the shadow decoration concept to create my castle. I didn't have a lot of time to put things together so Lost Boy stepped in to make my dream come true. He arranged my lighting (a flood lamp plugged into an inverter which was attached to a spare car battery in the trunk) and called me from work to tell me that there was a castle sitting on the table at Mother's for me. I had been planning to cut up a box between errands, but he knew I didn't really have time. When I walked into Mother's house I found a very sturdy, beautifully cut wooden castle cut out bolted to a piece of plywood (so it would stand up). It was lovely! Nobody guessed I was a Snow Queen, but that was okay. People thought I was a Princess, a Bride, or an Angel and I like all those too. One little girl looked at my trunk and said "This isn't scary at all!" Well, good. I had some cheap plastic rings left over from Girls Camp, so I took those and put several on my fingers (like the wicked Prince John from Robin Hood). Whenever a little girl in a princess (or bride, or fairy) costume came up, I would give her a piece of candy and then tell her that she looked like a princess (or bride, or fairy) and that she needed a ring. I would hold out my hands and let her pick which one she wanted. That was my favorite part. 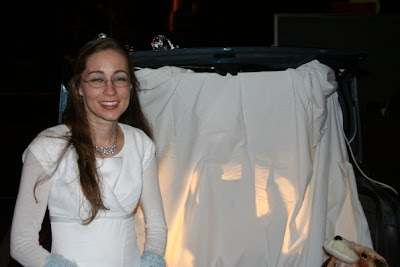 I really like the shadow concept for Trunk or Treat; my car was well lit and it was easy to see my decorations. I'm thinking about developing a flat screen to go on the car (maybe a frame with muslin stretched across it. Then we could do something new each year!